Of the dozen rabbis associated with Hillel who were leaders in Breira, Rabbi Max Ticktin was the only one to hold a national position with the organization. Founded in 1973, Breira was the first national American Jewish peace group to support a two-state solution openly. Ticktin recounts the concerns that he and fellow Breira founders and activists had about the direction of Israeli policies. He also discusses why the group fell apart so rapidly in 1977. Finally, Ticktin relates the story of his being ‘outed’ for attending a meeting with two Palestine Liberation Organization (PLO) representatives, while working as Assistant Director of National Hillel. Ticktin’s perspective was shaped by his close friendship with Yehoshafat Harkabi, who had served as chief of Israeli military intelligence from 1955 to 1959 and afterward became a professor of International Relations and Middle East Studies. He was supportive of the creation of a Palestinian state and wrote extensively about the need to rethink the old ideology and the dangers of militarism. The founders of Breira were idealists, who were not considering aliyah in the near future, but felt it was important to support “the kind of Zionism that we felt Israel ought to be expressing.” Their aspirations included Palestinian self-determination and more sensitivity to minorities within Israel. “Breira “overemphasized” the value of making rabbis central to its work. The leadership was convinced that rabbinic support also meant support from congregants. But they failed to recognize that there is often a significant gap between “the laity and the rabbi” in the average liberal congregation. Mainstream national Jewish organizations had cultivated ways of reaching these lay people. In 1976, knowledge of a purportedly confidential meeting between two PLO members and five Jewish communal organization representatives became public. This created problems for Ticktin. “The understanding was that we were going to have a free conversation, no notes taken, and no post discussion news release.” For a Jew to meet with the PLO in those days was “an act of treason.” To Ticktin’s dismay, details of the meeting, including names of participants, were leaked to major U.S. and Israeli newspapers. In 1978, Ticktin took early retirement after 30 years at Hillel and became an academic. Rabbi Max Ticktin was born in Philadelphia in 1922, one year after his family immigrated to the U.S. He also had family that had settled in Mandatatory Palestine in the 1880s. Ticktin did his rabbinical studies at the Jewish Theological Seminary. In 1947, Ticktin founded a short-lived support organization for the bi-nationalist organization Brit Shalom. 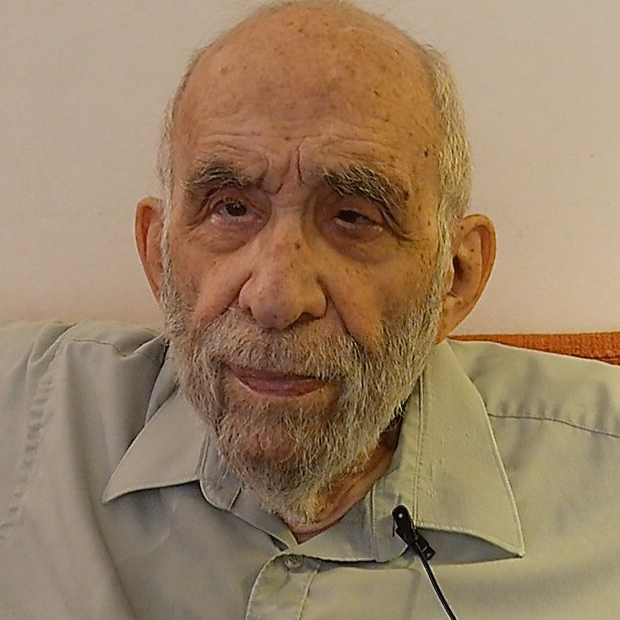 He and his wife Esther went to Hebrew University in the fall of 1947, where he met the famous intellectuals affiliated with the University– Gershom Scholem, Joseph Klausner, Martin Buber, Judah Magnes, and others. Classes were cancelled shortly afterwards they arrived, however, due to the violence, and Ticktin joined the Haganah. Ticktin and Esther had tea with Professor Buber (after having had a meeting with President Judah Magnes) one day before leaving Jerusalem. “He wanted to talk about the difficulties Buber had…in maintaining contacts with Arab intellectuals. They were in great personal danger then if people knew in their circles that they were meeting with Jews. He was quite saddened by that.” Ticktin and his wife left Israel in Spring of 1948 due to his wife’s pregnancy. Ticktin worked as the Hillel rabbi at the University of Wisconsin at Madison and the University of Chicago from 1948 to 1972 and as the Assistant Director of National Hillel in Washington, DC until 1978. He then became a professor of Hebrew and Yiddish Literature at George Washington University, where he remained until 2014. Ticktin was a founder of Breira in 1973 and served on the board until the organization closed in 1977.